Do you ever watch that show “Hoarder”? I have on a few occasions, close to dinner time at that (don’t ask me why we stick to that channel when there are literally over one hundred other stations to watch). I am definitely not the most organized person amongst people I know, but my house is relatively presentable now a days, so if someone drops by unannounced, I probably would not be super embarrassed and try to block them outside the front door. Now my fridge is another story (yes I am talking about the piece of machine I am not friends with at the moment AGAIN). I am probably considered a light weight hoarder when it comes to food items. my pantry is filled from top to bottom, my fridge was filled to the rim that I can no longer find items I need, because the light inside is being blocked by mountains of food… Since Houston is close to the gulf and we do have quite an interesting hurricane season every year, I tell myself we can probably last a couple of weeks before I start eying the animals (I kid, I kid…) Anyway, I have been using frozen and dry goods here and there the last couple of weeks while the fridge is out, I am happy to report the pantry is starting to air out, and freezer is getting brighter due to the visible light shining through. Though I am super excited for this weekend’s grocery shopping trip, looks like it’s time for the hoarding to begin again after the technician comes to fix the fridge on Thursday, YAY! 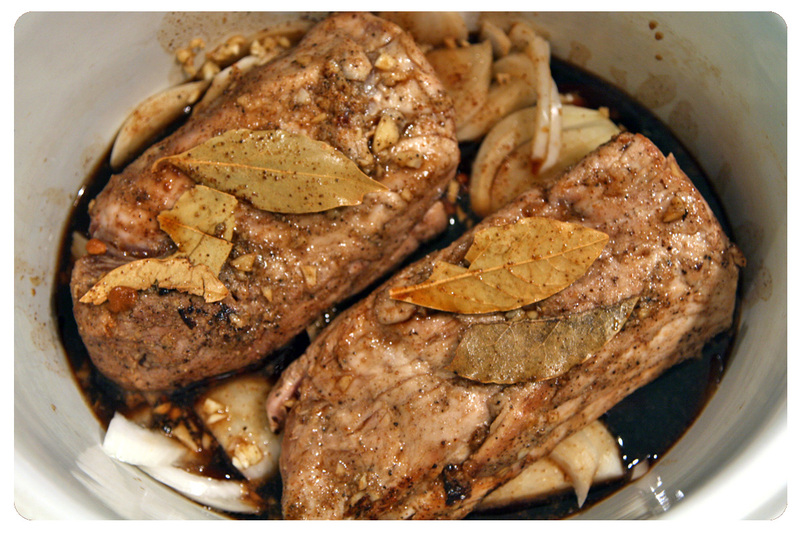 Anywho, I found a nice piece of pork tenderloin in the freezer today, decided to make use of the slow cooker again (pork and beef tend to get real tender in the crock pot). Dinner was a hit, it’s always fun to involve the whole family on “making” their own food, in this case we got to assemble the steamed pockets with various toppings, the pork was very flavorful and pretty effortless, hope you will give it a try also! This is how the tenderloins looked after browning, sitting in the slow cooker. Place onions in a 5-qt. slow cooker. In a small bowl, combine the garlic, salt and pepper. Cut roast in half; rub with garlic mixture. In a large nonstick skillet coated with cooking spray, brown pork in oil on all sides. Transfer to slow cooker; add bay leaves. Remove meat and onions from slow cooker; keep warm. Let stand 10 minutes before slicing. 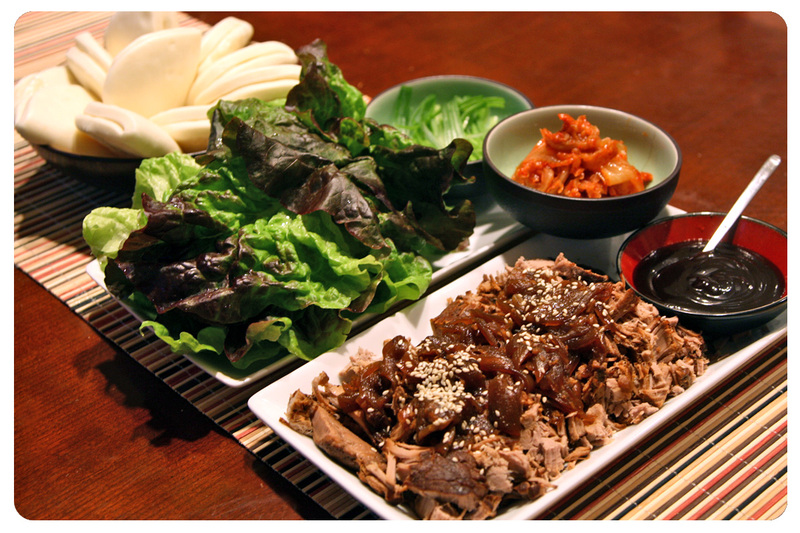 Slice pork; top with onions, sauce and sesame seeds. Serve with steam pocket, sauce, lettuce, green onions and kimchi (they really enhanced the flavor). Enjoy! Jeno, luckily you have real treasures in your freezer! You know I go crazy for pork and apart from pork liver I love every single cut of this animal (although the liver is delicious in pâtés in terrines; I hate it fried). Tenderloin is one of the best cuts of course and yours looks irresistible with the meat falling apart… The recipe seems so easy too! Unfortunately I don’t have a slow cooker (it’s not popular in Europe even though I saw it in shops but have never heard about anyone using it; I think it is even more rare than rice-cooker among the non-Asians). I might try copying your recipe in the oven or on a very low heat… I want to have my meat falling apart too! (Oh, and I have to wait before my butcher comes back from holidays; he is the only source of free range pork, apart from his shop I can only buy organic loin and ground pork). PS The lemon grass started to grow some white long leaves… Weird. I thought it wouldn’t grow at all. Thanks again! Hi Sissi! Ughhhhhhh about liver!!!!!! I have not eaten them for A LONG TIME, but the thought of it still creeps me out… I don’t normally purchase tenderloins, always think of them as more complex to prepare in Asian cuisine, (like Sweet and Sour pork, the process of frying them before stir fry). But after watching my family gobble everything up, I think this recipe will make a repeat performance pretty soon! Yay to your lemon grass! Thank you for keeping me updated! Jeno, I don’t have any relathionship with my butcher and I think I don’t make him earn a lot of money because I almost never buy beef or lamb, but usually pork (which is the cheapest meat, even cheaper than chicken breasts). I always buy the same 3 or 4 pork cuts, smoked bacon, chicken, pâté he makes which is really good and also his ham which is excellent. I rarely buy lamb, but sometimes too. I usually buy ground beef in my local Swiss supermarket because it’s organic, not as expensive as other meat cuts in Switzerland and it’s especially packed so I can use it in a couple of days (the ground meat from the butcher is wrapped in paper and has to be used the same day, which is a bit complicated because he is far away…). I rarely buy tenderloin simply because it’s the most expensive cut and I rarely use recipes which require it. Now I have a reason to buy it! Hi Shannon, so excited you dropped by! Isn’t it great when we slowly become our Mothers? 😉 I know years back when I first got married, my Mom tried hard to get me interested in cooking, but I always blew her off. Now a days we have an common interest, and it’s been awesome! Though to tell you the truth, I am probably the only ingredients hoarder in this family. Hahah! Your fridge is a treasure chest! 😀 I love how you combined bay leaves with Asian seasonings, I had no idea they would go so well together! Hahahaha, I know right? It’s strange how much food were stuffed in my fridge. To tell you the truth I don’t know what bay leaves actually do, not sure whether they add much to the taste, since the clove was pretty strong. The pork belly in steamed Chinese sandwich bun is one of the hottest things in NYC dining scene but your tenderloin version looks if not better but just as good as the belly buns I’ve seen here. That dash of hoisin sauce and a bunch of scallions do make a big difference! Thanks for sharing! Thank you so much Yi for your kind words! I have an aversion to fatty meats, so does little girl, hubby on the other hand grew up eating Vietnamese dishes created with pork belly, and I know he misses it a lot! Maybe when we do travel to NYC, it’s time to grab some pork belly steamed pockets! Cheez … I was just reading what Shannon said about becoming our mothers …. not true! How I wish it were! Mum is not a hoader … at all! Hmm … maybe I’m adopted. Anyway, my fridge hates me. It’s loaded right to its hinges and beyond. I was going to get myself a stand-alone freezer but my husband won’t allow it knowing what’s gonna happen. Slow cooker has been wonderful, especially during colder months, it’s so nice to come home to a house filled with delicious aroma, and knowing dinner is minutes away! Ha! I had never known that freezer section has the buns! Really? 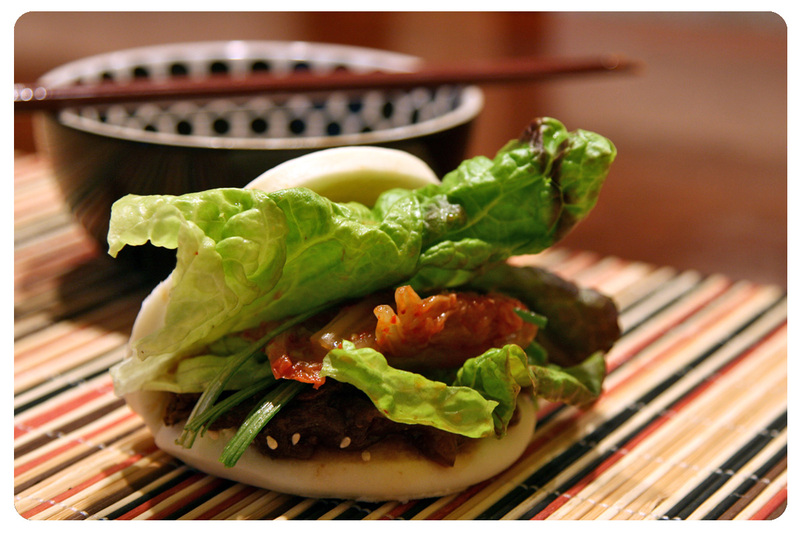 Omg, I am so buying these buns next time I go to the Asian market – maybe tomorrow! I always want to get a slow cooker (and pressure cooker) but I have to probably wait as I have so many things I want in the kitchen and my kitchen is not as big as I dream. Haha. But I should make this in a cast iron and cook slowly…since I’m home anyway, why not. 😉 Thanks for the recipe Cindy! Hi Nami! Yes I have never bought those bun pockets before either, they worked out real well, just steam for 10-15 minutes and they are fluffy/ready to eat! Slow cooker is essential in my kitchen, especially on lazy days. Jon used to cook with a pressure cooker, but I am so freaked out by them (hearing stories growing up, my Mom said they blew up in people’s faces due to all the pressure). I assume the technology has improved, so they should not be dangerous to use? This recipe is a little complicated for me, but i’m sure Mr Bao will be able to tackle it hehe so i’m gonna send it to him and hopefully he’ll be able to make it for me soon YAY! Hey Daisy, sorry I didn’t mean to ignore your comments! This is actually a very easy recipe, I’ve seen the wonderful food you’ve been making, this should be a piece of cake! Though do have Mr. Bao make it for you, you should be pampered after a long day of work! My hubby is driving me crazy with that show…it’s on Netflix and I cannot stand it anymore. I am not the most organized person either but my place also presentable so I have told him to stop watching or I will not clean at all LOL! Anyhow your pork tenderloin sandwiches or pockets are looking tasty.. defiantly my kind of food. Great recipe Jeno! Have a lovely weekend! Hi Sandra, that’s funny about your husband, I think it’s good for them to see how disgusting people live, so there’s no complain about the way we keep our house! Have a great weekend, we are suppose to get a cool front, fingers crossed for some fall weather! Congratulations Jeno 🙂 You’re fridge is working again woo hoo! I am so happy for you!!! I can only imagine the pain you had to go through all that time! But it still amazes me how you were able to still cook and whip up such delicious recipes 🙂 WOO HOO you rock girl! These pork tenderloins look soooo succulent and lol I’m very hungry right now so it’s probably not a good idea to read your post right now! Thank you Daisy! I am happy things are slowly getting back to normal, it’s been difficult not having a working kitchen, and eating out was getting pretty old, I got tired of eating all that greasy food around the neighborhood, even though hubby enjoyed it very much! I am trying hard not to be a hoarder again, since the house is looking nice and organized (the garage is another story). When I go to the grocery store I try to stick to a list, though to tell you the truth, this morning I was only suppose to pick up a few items, ended up coming home with $50 worth of stuff, just can’t help myself!